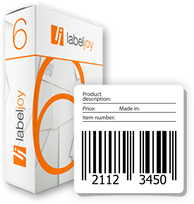 With Labeljoy it is easy to create Postnet barcodes. Postnet (Postal Numeric Encoding Technique) is a barcode symbology used by the United States Postal Service for mail delivery. The barcode is encoded in half- and full-height bars. Labeljoy Post net generator allows to encode 5, 9 or 11 digits, according to the Postnet standard required. Download the shipping label templatesand start creating and printing your own Postnet labels. Note: This type of symbology does not display visually readable text. Only texts of 5, 9 or 11 digits will be considered.